Just a day after McDonald’s announced plans for a new chicken item dubbed Mighty Wings, Burger King has come out with a revolutionary $1 French Fry Burger – to compete head on with its rival’s lucrative Dollar Menu. McDonald’s will roll out the Mighty Wings nationally as a limited-time offer through November, selling the bone-in chicken wings as three, five and 10 pieces, starting at $2.99. The morsels will come with nine different sauces to choose from including Chipotle Barbeque, Spicy Buffalo and Tangy Barbeque. Meanwhile, the French Fry Burger will launch on September 1 and will be available through the fall. Burger King is focusing more on cheaper items after McDonald’s aggressive push for its Dollar Menu, which brings in the most cash of all its offerings. 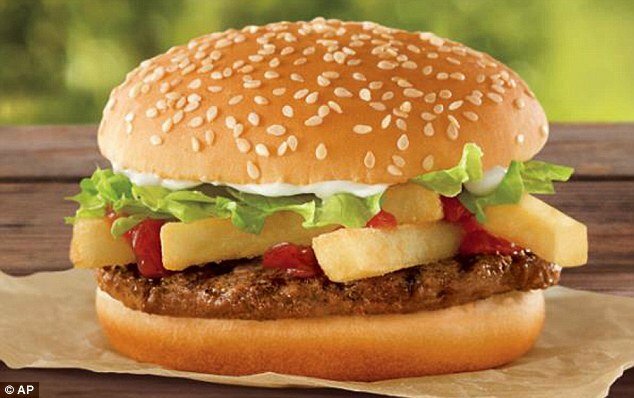 French Fry Burger, which clocks in at 360 calories and 19 grams of fat, is a relatively novel offering, but doesn’t require any extra investment from Burger King; it’s basically a standard beef patty topped with four of the chain’s french fries. McDonald’s has stepped up advertising for its Dollar Menu, which now features its Grilled Onion Cheddar Burger and a more substantial McDouble, which has two patties and a slice of cheese. That forced Burger King and Wendy’s to adjust their tactics earlier this year to stress value more clearly as well. Burger King, for example, has offered any two sandwiches for $5 and a Junior Whopper for $1.29. It’s not clear whether the strategy will pay off for the chains, or what impact it could have on wearing away at profit margins over the long term. But in the latest quarter, Burger King said its sales at North American restaurants open at least a year slipped 0.5%. Wendy’s reported a 0.4% rise, while McDonald’s reported a 1% increase for US restaurants. The metric is an important indicator of health because it strips out the impact of newly opened and closed locations. Other chains, by contrast, are faring better. Chipotle reported a 3.4% increase and Starbucks said the figure rose 9%.